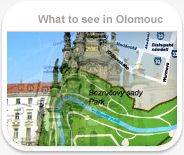 Here we introduce some compact packages for groups for which Olomouc is a transit destination. We are also happy to provide you with tours based on your personal needs. Just fill out the form at the bottom, and we´ll quickly get back to you.